This comprehensive conversion kit upgrades the Italeri C130 Hercules kit into a long fuselage C130J-30. It include necessary fuselage plugs, new engines and props, tires and cargo floors plus individual antenna array for each user nation. Of course the conversions comes with full markings and stencils. 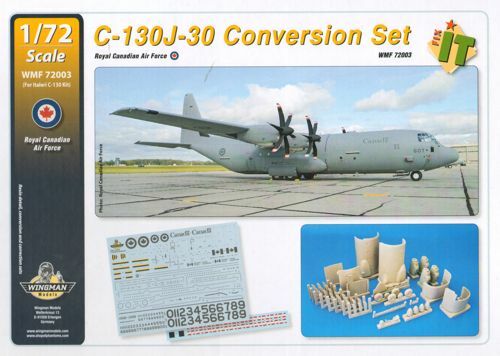 The high quality decals enable you to built any Canadian C130J-30 currently in service.